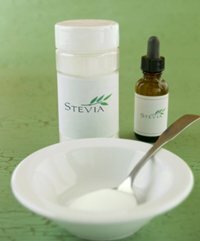 Natural sweeteners such as stevia sweetener or xylitol sweetener are an alternative to chemical sugar substitutes. A natural sweetener is usually a much better choice for your health than artificial sugar substitutes. Unless you are a diabetic, when it comes to sweetening your foods and drinks, its usually safer and healthier to use a naturally produced product than a chemical sugar substitute. Although the search goes on for the perfect natural sugar substitute, there are several that come close. There are two things to consider when you are choosing what kind of sugar substitute to use. Even if you are not a diabetic, you should give some thought about how different kinds of sweeteners can affect your health. Not all sugar substitutes are the same, even the healthy ones! Even a natural sugar substitute needs to be used sparingly. Some are healthier than others, but anything overdone can be problematic. One way to know for certain is to use a glucose meter to measure your glycemic response to foods using various sweeteners. That is the true test because this way you will know how that particular substance reacts in YOUR body. The companies that make these various sweeteners are not good sources of information, because they have a vested interest in selling you their product. Using the glycemic response of the meal containing the food or beverage containing the natural-sweeteners in question will tell you how it is really affecting your blood sugar. Even if you are not a diabetic, aim for as low a glycemic response from your foods as possible.